Obsessed with Casters and Hard Work Since 1907. "The history of this business could be summed up in just two words: hard work," wrote Hamilton Caster's former president Ralph Lippert in 1939. Four generations of Lipperts later, the message is still the same. But this is a history page, and we can't leave you with just two words. After all, we've been building casters since 1907, and there's a lot to talk about. Our story began in 1907, back when the Titanic was merely an idea. The company's founder, John Weigel, moonlighted as a caster maker from his tiny garage in Hamilton, Ohio. The very first Hamilton offerings were small shoe rack casters. 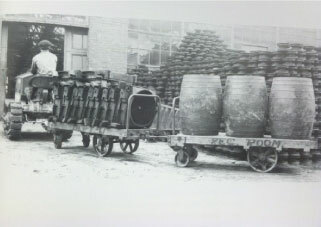 While the company struggled during the first few years, Hamilton earned a reputation for well-built, reliable casters. This set the tone for next century. Hamilton roared into the Roaring Twenties with full force – and innovation. 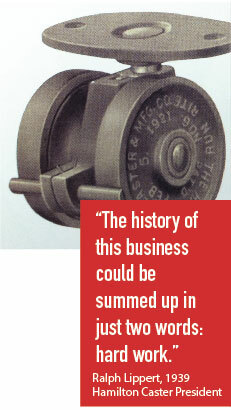 In 1925, Weigel patented "The Economic," or the strongest, most durable kingpinless caster east of the Mississippi. The caster, which featured an unconventional upper raceway for added vertical handling, was one of Hamilton's earliest innovations. And it certainly wouldn't be the last. Fun fact: The very first Hamilton kingpinless caster – made in 1925 – is proudly displayed in our offices today. Read more. In 1928, Hamilton entered the floor truck market with its purchase of H. Zering Mfg. in Cincinnati. But Hamilton's rapid growth came to a screeching halt in the 1930s, when the Great Depression devastated the United States. The economic effects of the depression and ill health forced Weigel to find a successor for the struggling enterprise. His daughter and son-in-law, Esther and Ralph Lippert, accepted the challenge by purchasing the company in 1939. Esther served as president until Ralph replaced her in 1943. As the war years faded, Hamilton became a nationally known purveyor of durable industrial casters and carts. By the late 1950s, the company became debt-free and with Bob, Tom and Larry Lippert now on board, the goal was to expand and conquer. The 1950s and 60s were crucial for Hamilton. Complacency was the last thing on anyone's mind. The third generation of Lipperts expanded the product line, printed modern catalogs, grew the distribution network, and launched PRONTO®, the industry's first quick-ship program. One of Hamilton's rugged new offerings, Duralast® polyurethane wheels, became a big hit in aerospace. Dubbed the "miracle wheel," Boeing used hundreds of them to help build the booster for NASA's Saturn V moon rocket in 1965. To keep up with rapid-fire growth, the company expanded its Hamilton, Ohio footprint. A larger office and factory ensured orders never outpaced Hamilton's capacity. And new technologies, like CNC machines and robotic welding, paved the way for more precisely engineered and custom products, and faster, more efficient production. 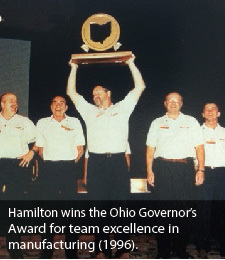 Hamilton's current and fourth-generation leadership – Dave, Steve, Jim and Mark Lippert – took the reins in 1995. Their mission? To build upon the momentum created by the previous generations, and propel Hamilton into the 21st century. 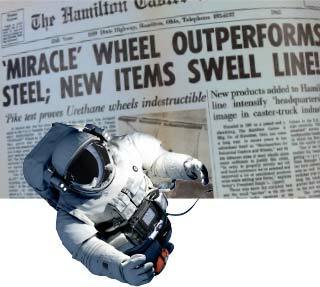 In 1996, Hamilton began the first phase of its lean manufacturing journey. Going lean meant more than a few cosmetic changes and slapping a buzzword on our home page. It meant embracing the same principles and discipline that helped Toyota go from small manufacturer to the world's largest automaker. To improve delivery times and quality, we started by reducing excess inventory and getting rid of wasteful or redundant factory processes. In 2006, we fully embraced lean by implementing it company wide, and hired a full-time lean manager to keep us focused on the mission. In 2012, the Goering Center named Hamilton Family Business of the Year, largely thanks to the lean efforts that helped us grow and improve – even during a recession. More recent innovations like Spinfinity™ maintenance-free casters and HPI™ swivel technology continue to move Hamilton to the forefront of the industry. We hope you enjoyed this Hamilton history lesson. We're proud of our roots and humbled by them. In 2015 Hamilton made history by building Colossus, one of the largest casters of all time. 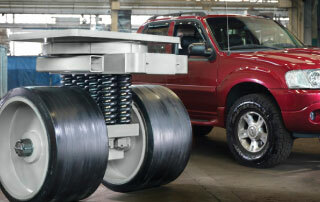 For a video and more on the 200-ton capacity casters, see our blog. Every day we walk past the 1907 caster and ever-expanding family tree in our lobby, we're reminded of the hard work that led us here. We celebrate our past because it shapes who we are as a company, and what we stand for. Who are we? What do we stand for? We're Hamilton. 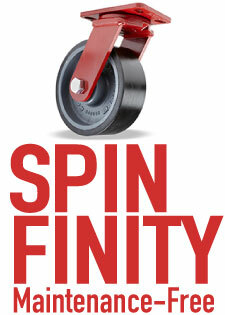 A 100-year-old American manufacturer that's forging ahead with the toughest casters, wheels and trailers on the planet. Join us as we embark on the next 100 years, and let's make history together.